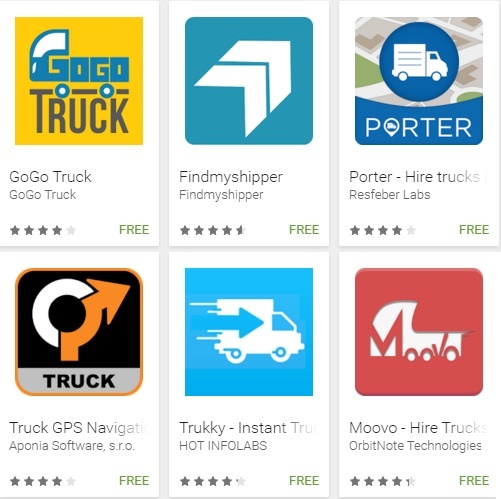 Truck booking apps - With the changing time and technology, people are now searching for on the go mobile apps for android mobiles or iPhone. More and more online truck booking service provider companies are now offering the iPhone or android apps for their transport queries. Why people are looking for the Truck Booking App? There are many options to use, while, contacting the transport companies. One may call directly to the company for transport or load related query or one may email or ask for quotation through website of the company. In addition to this now with omnipresence of the smartphone, one can also use the android application or iPhone application to contact the trucking companies. One can use such application on the go and those who need the service frequently would definitely like to install such applications on their mobile phones. How many Truck booking companies are having their mobile apps? If you will go through the Google Play store for the android phone applications. There, you can search for large number of mobile apps for transport and truck booking. Same is the case with AppStore. How to install the mobile apps? You just need to login to the Play store or AppStore and search for relevant mobile apps and just click on the install button to have that mobile application on your smartphone. Can you name a few mobile apps available on the Google Play store? If you have come across any other useful application in this category of transportation then let us know by commenting here. Truck Suvidha dot com is an online truck booking platform in India. They call their system as TruckSuvidha think ahead. This online truck booking website claims to increase the transport business with a single click. A website visitor can engage with the online chat system and ask for any transport, truck related issue. One can post a truck or post a load on the website after login into the website. The members of the website can also search through the directory of trucks and transport. The Truck Rental Portal claims to have more than 16 thousand transport contractors, more than 10 thousand fleet owners, more than 7 thousand commission agents and approximately 2 thousand transport brokers associated with the Truck Suvidha portal. TruckSuvidha has its social media presence on the social networking websites i.e. Facebook, Twitter, Linkedin, Google Plus and YouTube.com. www.Truckbooking.co.in has been launched today on the festive occasion of Holi. The initiative is just to reduce your tension and increase your smile just through a great service of online truck booking. Transport business in India is one of the largest but most unorganized. When a customer just needs to book a truck or lorry, he / she may not find the truck service provider in nearby through the internet. Though now a days few dedicated website for truck load and truck booking online has been launched in these years. Yet, the customers are not able to get the best truck load service across Indian cities. Our focus is to provide you all the latest information about Truck booking online and your transport services across India. This truck booking website will also provide you a comprehensive listing to companies offering truck and lorry to the customers for part load or full load in Indian cities.